I do not think I can present here any new information about Messner. It is enough to go to Wikipedia and you will find much more. But this is not the point. 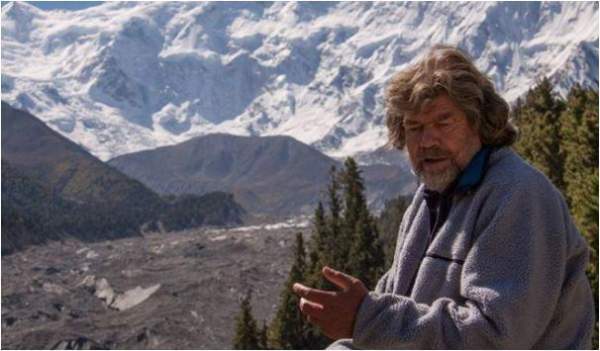 Here, I wish to say why I think Reinhold Messner is the greatest living human. Whether you agree or not is up to you, your opinion is welcome but I do not plan to argue with you. We may have a feeling that we live in times when truly great men and women are scarce. But there are true giants among us, the only question is if we are able to spot them and recognize as giants. Now, how to decide about the qualities of a truly great human being? Do they help others? Are they great leaders? Do they make progress in science and technology? Do they give hope to others? Do they struggle to preserve the mother Nature? Do they just pray in solitude for all humans? Obviously, there are many criteria to consider, and there is no way to agree about them. Therefore I am not trying to get a consensus here, I present my views. You are free to present yours. This is it, all in this title. Einstein has moved the limits of our understanding of the Universe and it is hard to find anybody who could match him. But better do not read about his personality, you might be disappointed. The same is about Newton, you might be surprised after reading a bit about him as a person. Did you know that Einstein got rid of their first child, a daughter, who was adopted by somebody? All information about the child is lost. You would not expect this from such a great man, wouldn’t you? Have you ever seen paintings of Caravaggio? If so, then you could perhaps see the work of a genius. But guess what, this man was in jail for killing a man with a knife. How about Gian Lorenzo Bernini. If you have ever visited Rome then you could not miss seeing his masterpieces, they are everywhere around. Well, this genius had his mistress’ face slashed with a razor and almost killed his own brother who was her lower. Those are human beings, with all bright and dark sides. But they were pushing the limits of human achievements. The same may be with Messner. Some write that he is a hard personality, grumpy, a person who holds grudges. In a movie about him there is somebody’s statement about Messner: “boundless vanity, self-promotion, does not respect nature, and does not believe in God.” Wow, very harsh words. I wonder how this person knows all this, nobody can know such things about somebody. I do not know him personally, so cannot say anything. I just hope they are wrong. I have never met him, pity, but I am still hopeful that I might meet him somewhere on a quiet path in the Alps. Once, I missed to see him at the Similaun hut. Only after seeing a video, I realized he was there in the same period when I spent a night in the hut. But I know the facts, see some below. In 1974 he climbed, together with Habeler, the North Face of the Eiger via the classic Heckmair route in 10 hours, this was an astonishing achievement at that time. One year later, in 1975, they introduced Alpine style to the Himalayas and climbed Gasherbrum I without supplementary oxygen, a new route without fixed ropes, without pre-established camps. In 1978 they were the first people ever who reached the summit of Everest without supplementary oxygen. He was the first man ever to climb every mountain over 8,000 meters, and there are 14 of them. But this is not all, he climbed them all without supplementary oxygen. He was the first person ever to climb Everest solo. He was the first person ever to climb all the Seven Summits without the use of supplemental oxygen, those are the highest points on every continent. If you follow the link, you will see him in the table. He and Arved Fuchs were the first to cross Antartica without any assistance. He was the first known person who walked the Gobi desert, on its longer size, a 2000 km walk. He walked across Greenland, a 2220 km tour in 34 days. This is far from a complete list. I give only those that are the top 10 for me. From everything he did, I would say I am most impressed with his philosophy of carrying your stuff yourself. He introduced this in the high mountains in Asia instead of typical expedition practice. Mountains are cathedrals, and it is unacceptable and humiliating that others carry things for you. For the same reasons, I am sure I shall never climb Kilimanjaro, I know that all must be organized, they carry even some plastic chairs for you, prepare your tents, etc. Those are picnics, not mountaineering. Related to this, in one of my earlier texts, I was making a joke about the Korean president who apparently climbed a mountain, and I compared his style and the style of Messner. Have a look. But who cares what he did? Indeed, he did it for himself, for his own pleasure. So why would we care? Well, have a look in the list above and think how it is possible to do so many things in just one human life, and remember, there is much more to that. Try to think about the following. Before he did each of those achievements, if you would ask people if this was doable, my guess is the answer would be “no”. But he showed the opposite, he moved boundaries more than any other living human being. He says in a video: “in the mountains, we see how fragile we are”. But see from his own examples what such weak and fragile human beings are able to do. This is why he is the greatest living human for me. Did you know that after his big achievements, they wanted to know what kind of superhuman he was? Yes, and they did some measurements regarding his aerobic capacities. This is measured in milliliters of oxygen used in one minute per kilogram of body weight, well, something complicated. And can you guess what they found? He is just a normal, average person. Do you know that in India they touch a shoe of a person to show respect? I have seen this even in scientific circles, one girl was touching the shoe of an Indian physicist. For me as a European, this was quite unusual, and this was not in India, it was at the ICTP Institute in Trieste, Italy. Can you guess whose shoe I would touch? Or should I say “boot”? This is a small addition after I heard about a tragic accident where yet another great mountain climber lost his life. There are many reasons why Messner is one of the greatest mountain climbers, you have seen some above. He himself says, in a video available on YouTube, that there cannot be anybody who could be called the greatest climber of all times. This is simply because there cannot be a comparison, you cannot compare climbers from different times. Instead, as he rightly says, there are the greatest climbers in certain periods only. So he was the greatest in the 70s, no doubt about that. But there is one more reason why he is the member of this club of the greatest: he lived to tell his story. I remember a sentence heard from someone, getting to the summit is optional, getting back alive is compulsory. Messner is still among us, after everything he has done, and I hope this will be so for many more years. I am still hopeful I might meet him somewhere in the Alps. Note that there is a text here in the site about ethics of climbing Mt Everest, so check it here.